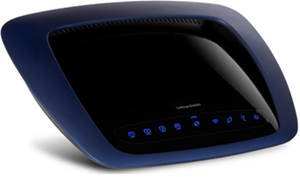 The Linksys E3000 High Performance Wireless-N Router is a simultaneous dual-band router. It broadcasts two (2) wireless frequencies: the 2.4 GHz and 5 GHz. It allows you to access the Internet via a wired or wireless connection. It has a built-in Storage Link that allows you to easily add Gigabytes of storage space to your network using USB 2.0 hard drives, or plug in a USB flash disk to access your portable data files. The Linksys E3000's built-in media server streams music, video and photos from an attached storage device to any UPnP-compatible media adapter or player. Furthermore, installation and use of the Linksys E3000 is easy using the Linksys Connect software which automatically installs in your computer when you run the setup CD. It has a Guest Access feature that allows you to provide Internet access to your guests without granting them access to your local network. • Wi-Fi Protected Access 2 (WPA2™) security provides encryption for data on your wireless network. • Stateful Packet Inspection (SPI) firewall blocks unwanted access to your Linksys E3000. • Network Address Translation (NAT) technology protects and allows your entire network to access the Internet using a single Internet IP Address. 1, 2, 3, 4 (Green/Blue) - The LED stays lit when the Linksys E3000 is connected to a device through one (1) of its Ethernet ports. It flashes to indicate network activity over a certain port. The LED lights up green when the port is connected to a Gigabit port. It lights up blue when the port is connected to a 10/100 port. Wi-Fi Protected Setup™ (WPS) button - If you have client devices, such as wireless adapters that support Wi-Fi Protected Setup™, then you can use the Wi-Fi Protected Setup™ (WPS) button to automatically configure wireless security for your wireless network(s). Wireless (Blue) - The Wireless LED lights up blue when the wireless feature is enabled. It flashes when the router sends or receives data over the network. Internet (Green/Blue) - The Internet LED lights up when a connection is made through the Internet port. It flashes to indicate network activity over the Internet port. The LED lights up green when the port is connected to a Gigabit port. It lights up blue when the port is connected to a 10/100 port. USB (Blue) - The USB LED lights up blue when a USB device is attached. It flashes when data is being sent to or received from this device. Power (Blue) - The Power LED lights up blue when the router is powered ON. When the Linksys E3000 goes through its self-diagnostic mode every boot-up, the LED flashes. When the diagnostic is complete, the LED is continuously lit. USB Port - The USB port connects the router to a USB storage device as well as printers. To learn more about connecting a USB printer to your Linksys Router, click here. NOTE: The Linksys E3000 USB port supplies up to 1000 mA power on devices. It also supports FAT32 and NTFS data storing formats. For a list of tested USB storage devices for the Linksys E3000, click here. Internet - The Internet port is where you connect the Ethernet cable from your modem. You will need to connect one (1) end of the network cable to the Ethernet port on your cable or DSL modem and the other end to the Internet port on your Linksys E3000. Ethernet 1, 2, 3, 4 - Using Ethernet cables, the Ethernet ports connect the router to computers on your wired network and other Ethernet network devices. Reset - There are two (2) ways to reset the router to its factory defaults. You can either press and hold the Reset button for 10 seconds, or restore the defaults from the Administration > Factory Defaults page on the router's web-based setup page. To know more about resetting your device, click here. Power Switch - Press the I located at the back of the router to power ON. Press the O to power OFF the router. Power - The Power port is where you connect the power adapter.